GREEN BAY —The University of Wisconsin-Green Bay theatre program will present “Anatomy of Gray,” a comedy/tragedy written by Jim Leonard, later this month. 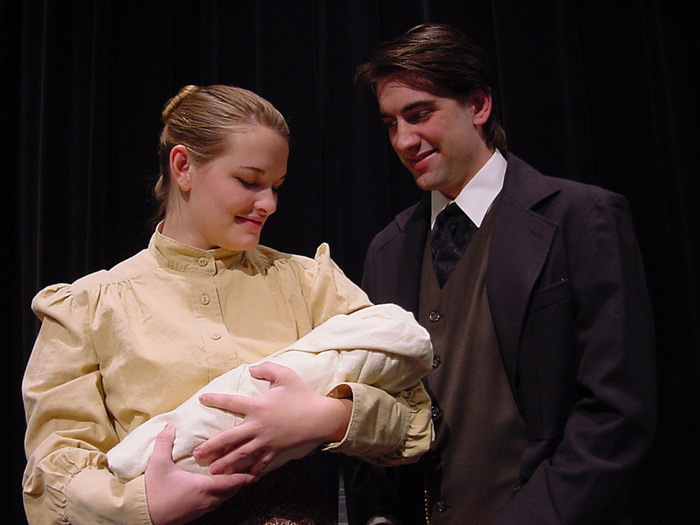 Theatre Prof. John Mariano directs this story of story of love, loss and healing. 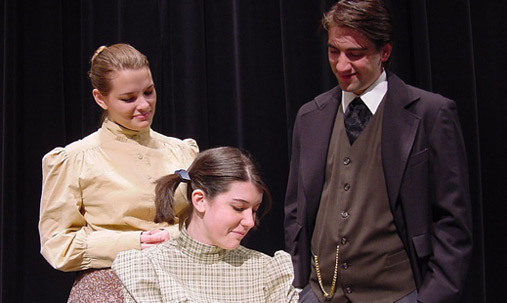 The play follows June, who is suffering the loss of her father, when both magical healing and a tragic plague disrupt her small town of Gray, Ind. 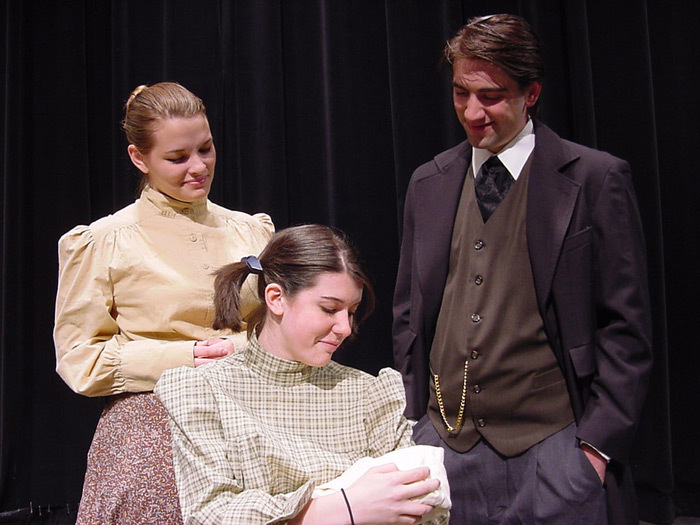 Set in the late 1800s, June prays for a healer to come so that no one will ever suffer again. When a mysterious man comes to town claiming to be a doctor, healing certainly happens, but trouble comes next. 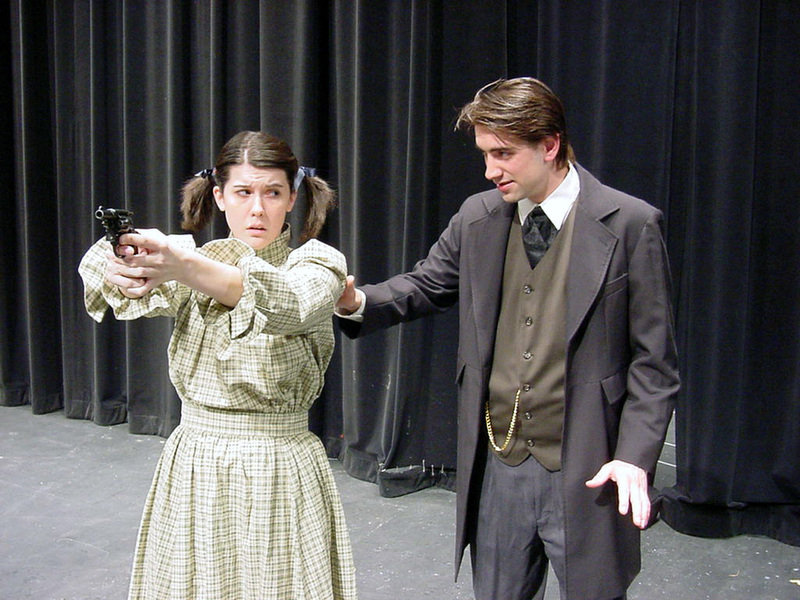 The UW-Green Bay production of “Anatomy of Gray” features nine student actors and a crew of UW-Green Bay students and faculty members. 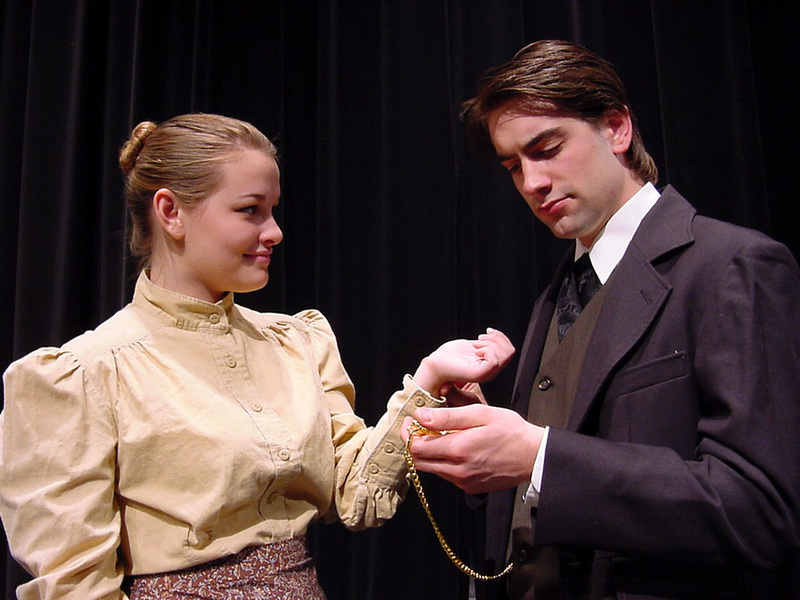 Performances at UW-Green Bay’s Jean Weidner Theatre are scheduled for Oct. 15-17 and Oct. 21-24. All shows begin at 7:30 p.m.
Tickets are $15 for adults and $12 for students and seniors. Order online at www.uwgb.edu/tickets or call (920) 465-2217 or (800) 328-8587. This entry was posted in Headlines, News Releases on October 6, 2009 by Michael Heine. 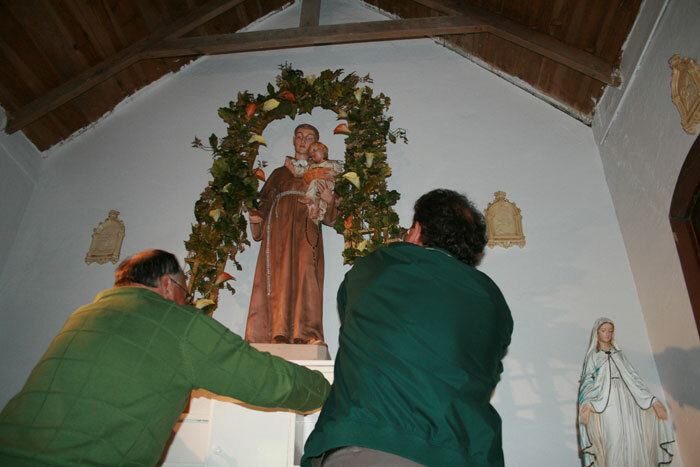 Plenty of Green Bay media outlets were on hand for the return of the statue of St. Anthony to the LeMieux Chapel in the Cofrin Memorial Arboretum. 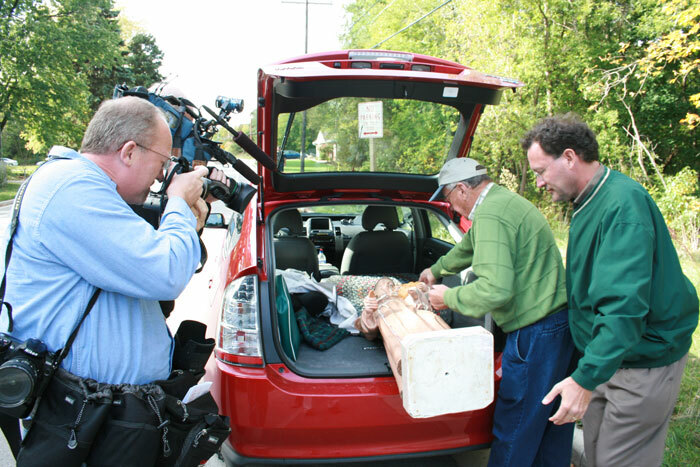 All four Green Bay TV stations came out, along with a reporter and photographer from the Green Bay Press-Gazette and a radio reporter from Wisconsin Public Radio. This entry was posted in Media Coverage on October 2, 2009 by Michael Heine. When the patron saint of things that are missing goes missing, people still pray to that patron saint. 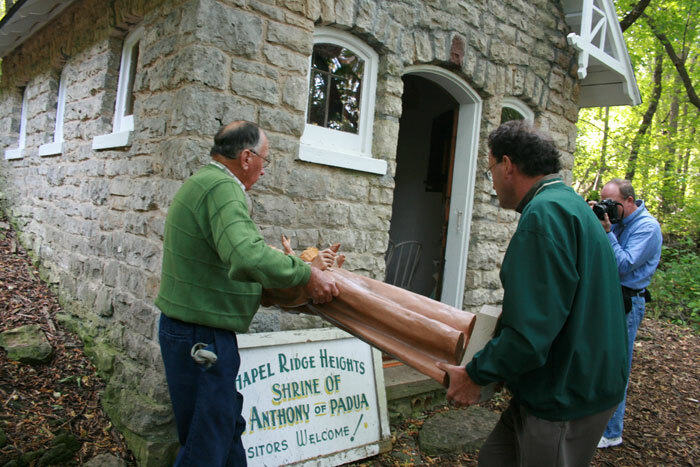 And in this instance, it worked, said Joan Jadin, owner of a statue of St. Anthony that was stolen from the chapel her family built in the woods that would become part of the Cofrin Memorial Arboretum. 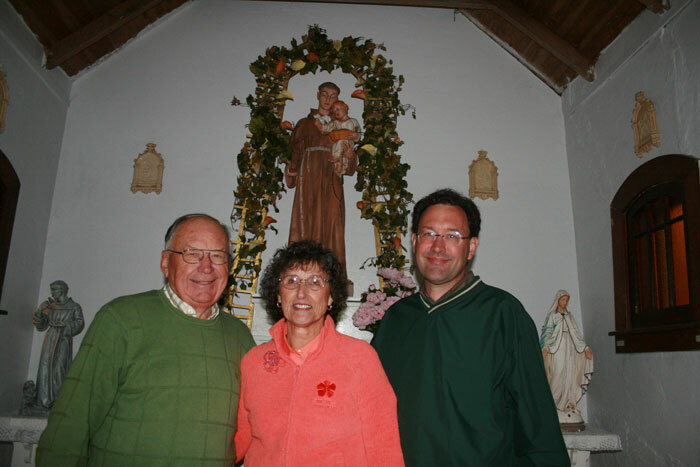 Joan and Norbert Jadin take care of the inside of the LeMieux Chapel, which became a lasting part of the UW-Green Bay campus when the University acquired the land to expand the arboretum about 25 years ago. 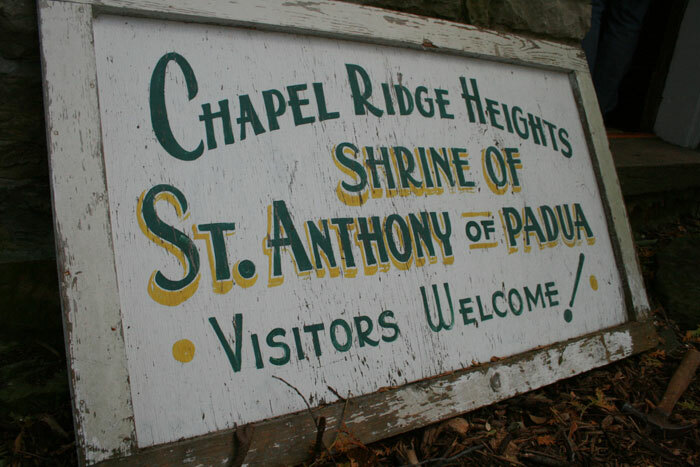 Joan’s grandparents built the chapel on the back of their property when they lived on Bay Settlement Road decades ago. Under terms of the LeMieux sale, the University agreed to routine chapel upkeep. It could not, however, pledge scarce resources to structural work in keeping with the arboretum’s nature-first mission. Joan and Norbert were heartbroken to hear that the statue was stolen from the always-unlocked chapel sometime in early summer. They called local media outlets to report the news and seek help in its safe return. A passerby discovered the statue in a ditch in the Baird Creek Parkway a few miles from campus. 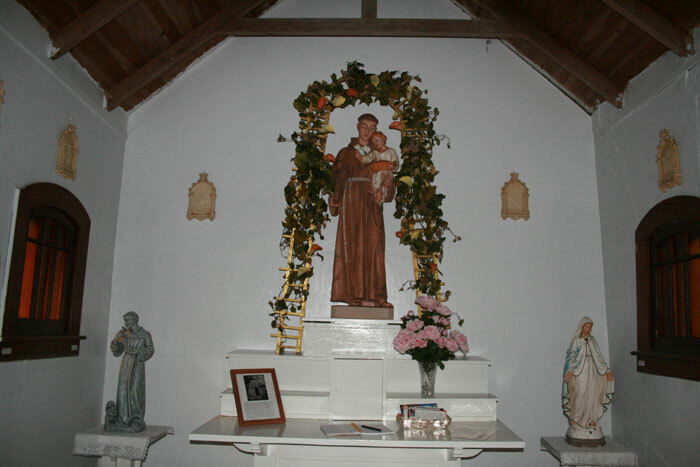 It was spray painted white and St. Anthony’s hand had been broken off. But it was in otherwise good condition, and her family was thankful it was not completely destroyed, Joan said. “It felt wonderful, just wonderful, to see that it wasn’t all broken into pieces,” Joan said. 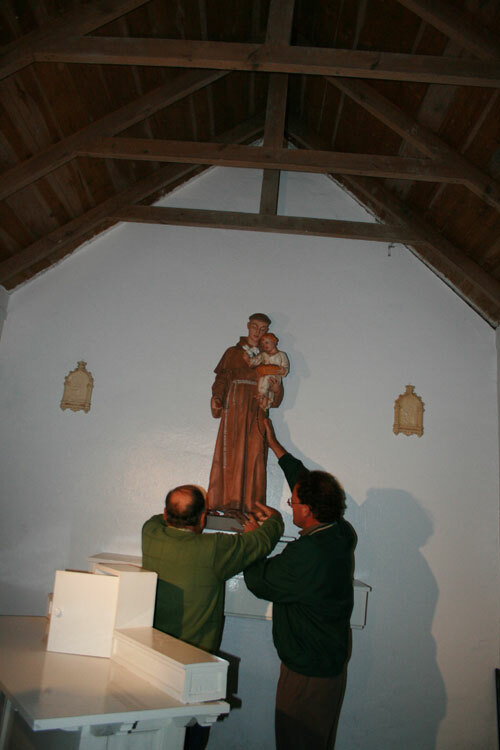 A local artist gave St. Anthony a fresh coat of paint and carved a new hand based on the original look of the approximately 80- to 90-year-old statue. 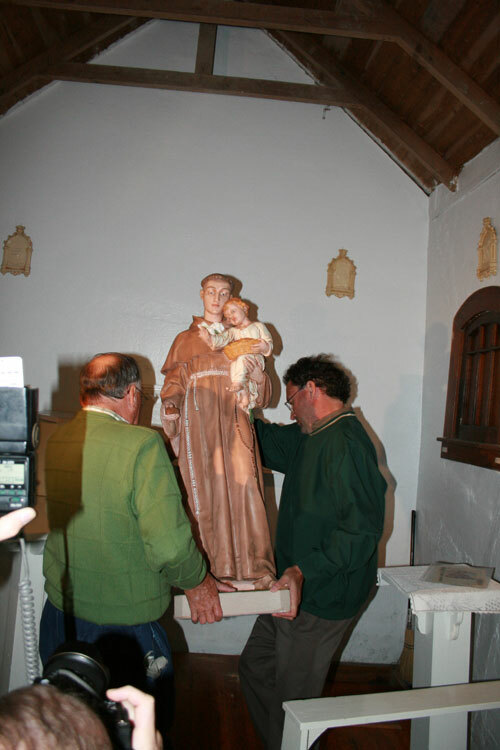 On Thursday (Oct. 1), the Jadins returned the statue to its space behind the alter in the center of the chapel. 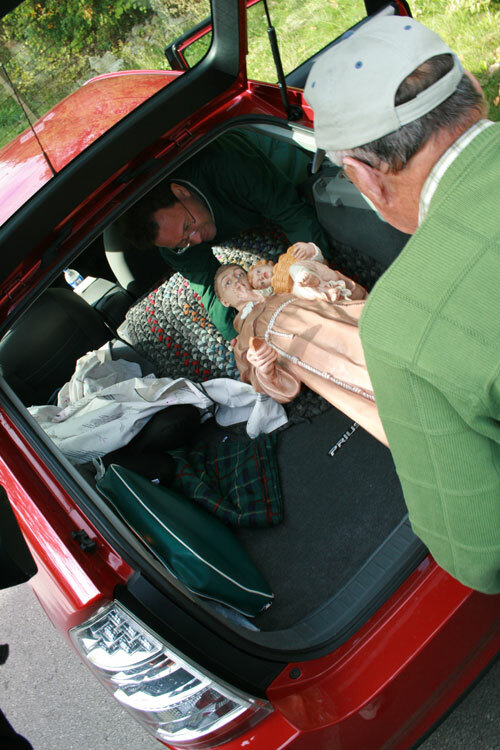 Local media outlets from Green Bay covered the event as the story of the missing patron saint of things that are missing came to a happy ending—St. Anthony is no longer missing. While the statue has been returned, the person or persons responsible for its disappearance remain at large. Anyone with information about the theft of the statue are asked to call University Police at (920) 465-2300 ext. 2, or the Crime Stoppers Hotline at (920) 432-7867 if they wish to remain anonymous. 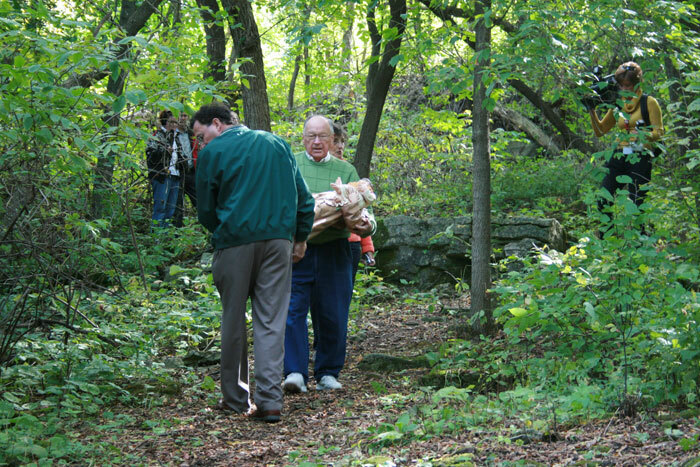 This entry was posted in News and tagged Arboretum, community, Photos on October 1, 2009 by Michael Heine. GREEN BAY — Phuture Phoenix Day returns to the University of Wisconsin-Green Bay campus for the eighth year, bringing more than 1,300 fifth-graders one step closer to the college experience. Students from 13 Green Bay elementary schools and nine other area school districts will visit classrooms, residence halls, the Cofrin Library and other parts of campus Tuesday (Oct. 13) and Thursday (Oct. 15). They also will connect with more than 300 UW-Green Bay student mentors. Some will get to meet Wisconsin First Lady Jessica Doyle. She plans to visit with the students and their mentors from 10:45 a.m. to 11:45 a.m. Tuesday. All invited fifth-graders and their teachers participate in planned activities and get to know their mentors in group settings. Phuture Phoenix Day is a coordinated effort to inspire academic success and alert children to educational opportunities beyond high school. Students tour the University and are invited into classrooms and lab areas for various experiments and activities. Some may learn new phrases in foreign languages or hear music students perform. New during Phuture Phoenix Day is a stroll through the Lawton Art Gallery on campus, playing soccer with members of the Phoenix soccer teams in the Kress Center turf gym, and classes featuring food science, ecology, and dance. Some students will even get to make slime with chemistry Prof. Julie Lukesh and UW-Green Bay students. One class will also let Phuture Phoenix students use clickers, an interactive technology that lets students answer questions with individual remote controls that can tabulate classroom responses in real time. Many UW-Green Bay professors use the technology in their classrooms to show class comprehension or even give quizzes. Additionally, students will have the opportunity to compete with many of UW-Green Bay’s Division I athletes in the new Kress Events Center. The Phuture Phoenix program partners with schools with high percentages of students from low-income families and encourages students to graduate from high school and pursue a college education. The number of students involved in the program has nearly tripled since it started in 2003. Phuture Phoenix Associate Director Stephanie Cataldo Pabich said the program is stronger than ever and continues to lead the way to a college education for thousands of youngsters in Northeastern Wisconsin. The expected attendance of more than 1,300 students should set a record, she said. More than 850 fifth-graders will be at UW-Green Bay, 2420 Nicolet Drive, from 9:45 a.m. to 2 p.m. Tuesday. An additional 475 will visit the campus from 10 a.m. to 1 p.m. Thursday. School districts involved in Phuture Phoenix are Green Bay, West De Pere, Oneida Nation, Bonduel, Bowler, Menominee Indian, Oconto, Oconto Falls, Sturgeon Bay and Suring. This entry was posted in Headlines, News Releases and tagged Phuture Phoenix on September 30, 2009 by Michael Heine. 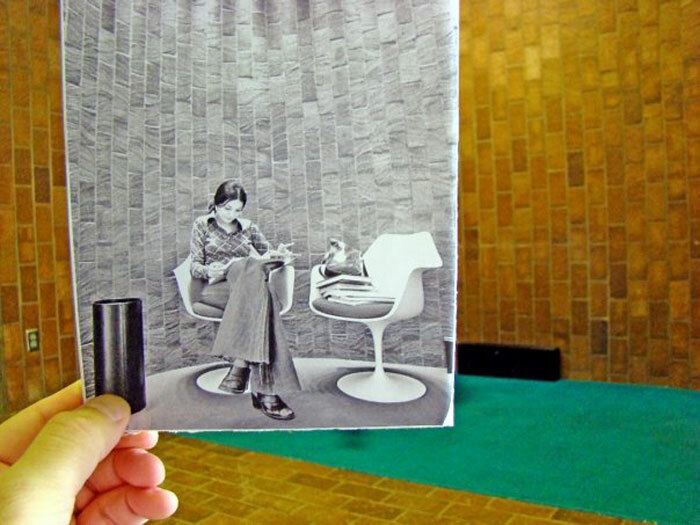 Give UW-Green Bay Student Services Webmaster Todd Sanders a camera and he’ll take you on an adventure through time. 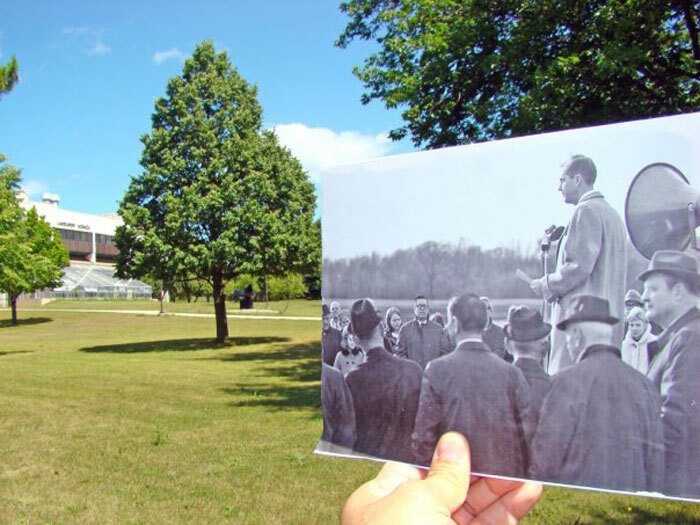 Sanders has been showcasing UW-Green Bay in a “Now-and-Then” photo album on the University’s official Facebook page and on the photo-sharing site Flickr. 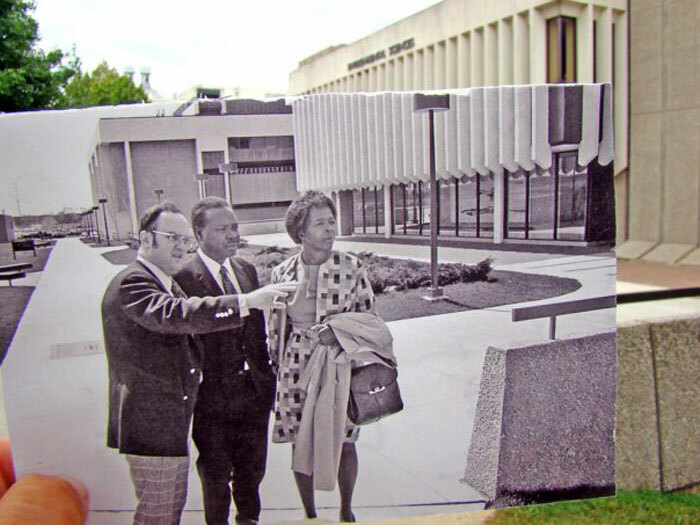 The album shows old images taken on campus up against current images taken in the same, or nearly the same, spot. “WILD! 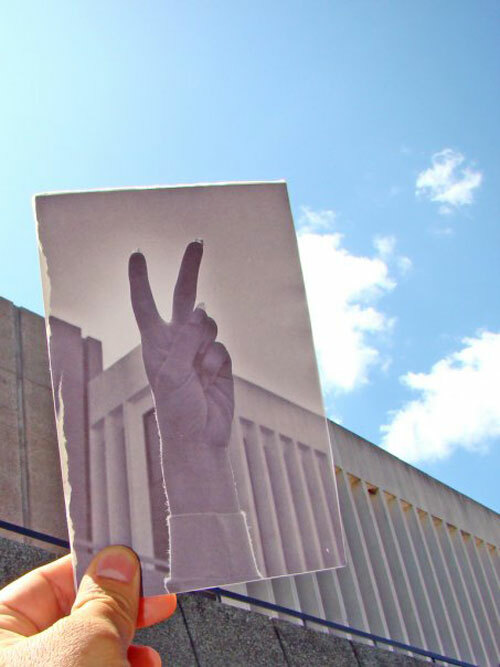 I really love these pictures,” one fan of the UW-Green Bay Facebook page posted. “Very cool,” another commenter said. Sanders said got the idea from an article in Wired magazine about a “Looking Into the Past” Flickr group. 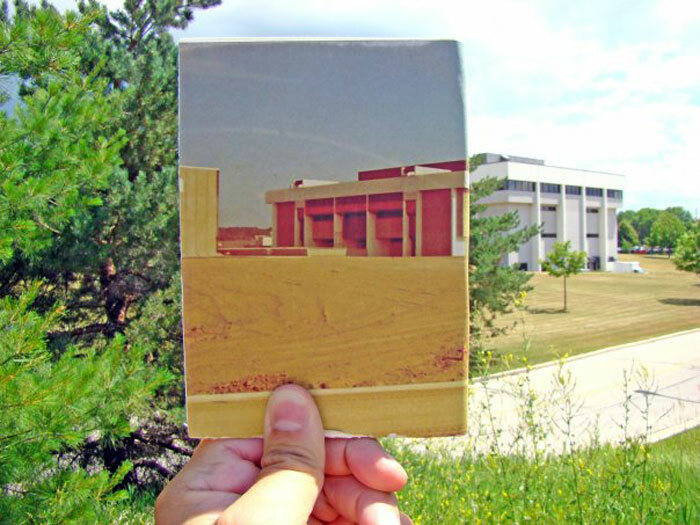 He tapped into the collection of campus photos housed in the University Archives and Special Collections for his project. “It’s a great way to show that even though we’re a young campus, we do have some history,” Sanders said. We’ve included the “wild” and “very cool” photos below. 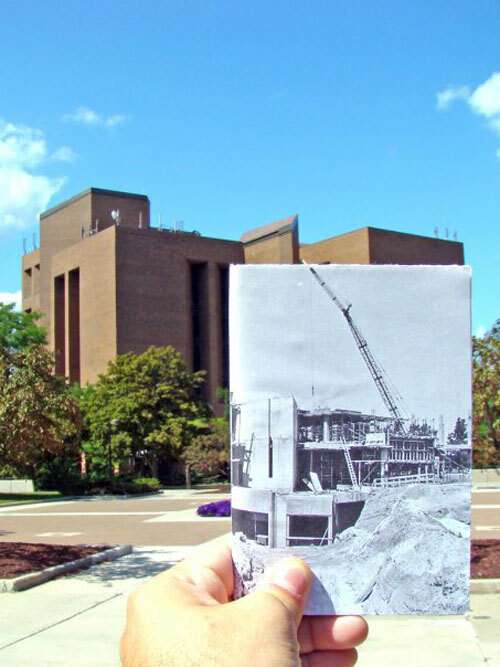 “Go Green,” take a look and enjoy a trip through time back to the original Eco U era on the UW-Green Bay campus. This entry was posted in Go Green! 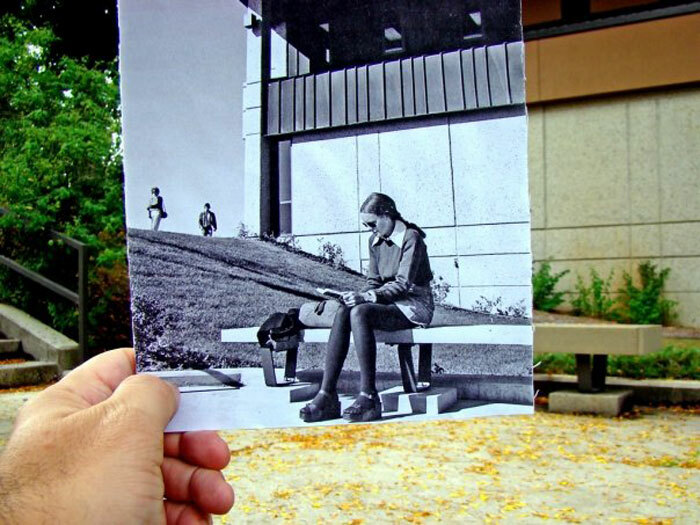 and tagged Photos, UWGB history on September 30, 2009 by Michael Heine. GREEN BAY — A four-year federal grant award of $1.2 million will assure that high school students will continue learning at the Regional Center for Math and Science on the University of Wisconsin-Green Bay campus. 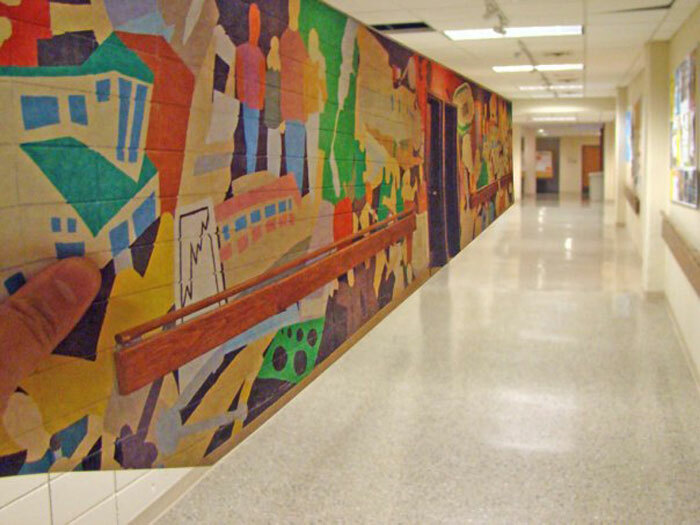 The continuation grant, awarded recently through the Department of Education’s Federal TRIO Programs, will allow the program to run through at least 2013. The Regional Center for Math and Science serves low-income first-generation students interested in majoring in science, technology, engineering or mathematics. 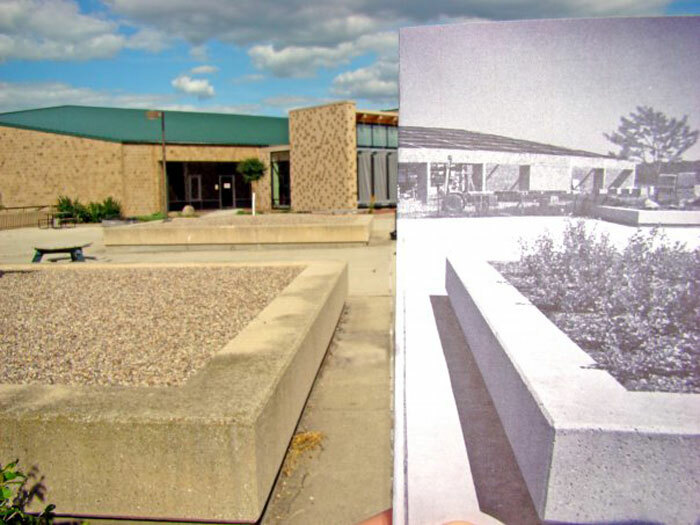 In its 17 years of operation at UW-Green Bay, the center has served more than 600 students from around the Midwest. Of those, 92 percent have gone on to college and 76 percent have graduated from college, about three-times the expected rate for students from the demographic served by the program. Also, 69 percent of the Regional Center for Math and Science program participants graduate from college with degrees in science, technology, engineering or math fields. “The Regional Center for Math and Science program is an investment in our youth,” says Program Director Michael Casbourne. “It gives help to students who wish to develop their skills, motivation and knowledge needed to achieve their goals and dreams of continuing on to higher education. The Regional Center for Math and Science is a federally funded, six-week residential pre-college program designed to enrich and enhance high school students’ understanding of math, science and the nature of scientific research. Educators at the center work with students for two summers at UW-Green Bay, and stay connected throughout their last two years in high school. The center uses technology to advise, tutor, academically develop and network with students. It also coordinates college campus visits for students, opportunities for students to hear guest lecturers on college campuses, and student participation in leadership and academic development conferences and workshops. The Regional Center for Math and Science at UW-Green Bay focuses its emphasis on health sciences. Careers in medicine, nursing, physical therapy, medical research and others are explored. Educators at the center include UW-Green Bay faculty and area schoolteachers. Students come to UW-Green Bay from Wisconsin, Illinois, Indiana, Michigan, Minnesota and Ohio. They are either from low-income families, or would potentially be first-generation college students. More about the Regional Center for Math and Science can be found online at http://www.uwgb.edu/rcms/. This entry was posted in Headlines, News Releases and tagged connecting, diversity, grants, students, Summer Camps on September 29, 2009 by Michael Heine. GREEN BAY — The University of Wisconsin-Green Bay Institute for Learning Partnership announced its 11th annual Fall Conference, scheduled for Thursday and Friday, Oct. 8-9, in the Phoenix Room of the University Union, 2420 Nicolet Drive. This year’s conference theme is “Closing the Achievement Gap through Literacy Leadership,” lead by keynote speaker Ellin Keene on Thursday, Oct. 8. Keene is the director of research and development for the Denver-based Public Education and Business Coalition and is senior adviser to Heinemann Professional Development. Along with extensive work in the classroom, she has also written three books and numerous chapters for textbooks and journals. The Thursday evening presentation will be centered on the topic of “Literacy Comprehension and the Development of the Intellect,” focusing on how to transform literacy lessons from ordinary to extraordinary for all types of students. The evening’s events begin with a Showcase of Educators from 6 p.m. to 9 p.m., highlighting the literacy research of area educators, with the keynote speech by Keene from 7 to 9 p.m.
Friday’s seminar begins at 7:30 a.m. with another presentation by Keene called “Critical Questions in Literacy Leadership.” Keene will address the different questions involved in literacy instruction. The day continues with two breakout sessions led by local educators, followed by a literacy demonstration by Keene with a group of local children until 2:30 p.m.
Members of each school district are encouraged to attend both the Thursday keynote speech and the Friday workshops. The program is free and open to the public. Visit www.uwgb.edu/learnpart for more information on this event, including descriptions of the speakers and topics. Register online or call (920) 465-2480. This entry was posted in Headlines, News Releases on September 28, 2009 by Michael Heine. UW-Green Bay Prof. John Luczaj may know more about what’s underneath Brown County than the good people who answer Digger’s Hotline. Well, he may not know where sewer lines and power cables are, but he does know what’s far beneath those in Brown County. Luczaj is mapping the bedrock of the entire county, determining what kind of rock formations are where, and at what depth they begin and end below the surface. Working with students and other experts from the Wisconsin Geological Survey, Luczaj hopes to produce a large sub-surface map of the county. He suspects the map will be used by engineers, home builders, pipe installers, well drillers, quarry or gravel pit operators and educators. “Basically, knowing where the rocks are will help anyone who is doing engineering projects, building projects and potentially quarrying operations,” Luczaj said. The study also led to the re-discovery of a non-active fault line, which stretches from near Greenleaf to the south. Drilling rock cores in different areas showed the same rock formations appearing at different depths in a linear formation. “There’s at least 100 feet of vertical displacement along a particular ancient, non-active fault zone, and later this fall we hope to explore this by doing some subsurface techniques like seismic investigations,” said Luczaj, who noted the fault appeared on one very old map. Luczaj added that he and students would be the first to more fully explore the ancient fault. The project, which is funded through grants from the U.S. Geological Survey and the Wisconsin Geological and Natural History Survey, will continue at least another two years before the maps are completed and published. Rock formations that were created millions of years ago under ancient seas near the equator certainly can’t be explored overnight. There is a lot underneath Brown County that we don’t know about. And Prof. John Luczaj, a geologist, wanted to find out. So with a grant in hand, he set out to physically map the bedrock of a large portion of Northeastern Wisconsin. The overall goal of this project is to map the bedrock geology for Brown County. So, students and I here at UW-Green Bay, in conjunction with the State Geological Survey, are working to make 20 quadrangle scale maps, and eventually assemble them into one large map for Brown County. On the map, we’re going to have each of the different kinds of rock formations, some of which are shale, or dolomite or sandstone, and this will be supplemented by things like cross-sections, showing what’s underneath the ground, and all of the outcrop places where we’ve done the research. There are a number of people who will probably end up using the map. First of all, for an educator like myself, it’s useful to have an idea of what rocks are in what location. And other people as well will use this map. Engineers want to know the depth to bedrock. Other people want to know whether or not this area would be a good resource for opening up a quarry or something like that. Basically, knowing where the rocks are will help anyone who is doing engineering projects, building projects and potentially quarrying operations. Students themselves are getting hands-on experience both in the field with John, and in the laboratories. Some of the things the students do are accompany me in the field. If I go in places where it might be dangerous or where somebody wouldn’t find you if you slipped and broke your ankle, that alone is useful. Sometimes it’s important to have another set of eyes in the field to look for things, or to measure things, so that’s one of the things students do in the field. In the laboratory, I have students cutting rocks, like drill cores. Here’s an example of a drill core that’s been cut. And, it’s a time-consuming process, but it’s a pretty handy thing for students to do, so we have them cut rocks, polish them, make thin sections for microscopic study or chemical analysis and a bunch of other things. Students are also helping me interpret some of the geology in the field. So, they do lots of variable tasks. Comparing textbook learning vs. learning in the field, or learning in the laboratory is having the hands-on is completely invaluable. Just knowing your research and being able to see it, in-hand specimens, in the field and in drill-core, the three specimens can look completely different than just learning it in a textbook. So it’s completely invaluable to have hands-on experience. Finishing the map takes some time. But when it’s completed, it will be available to anybody who may need it. Right now we’re in the second phase of a two-year project. In the end of the spring semester, the deliverables, the maps I’m going to make are due for the western half of the county. They’re due to the United States Geological Survey. So, during that mapping process, I use ARC Map, a GIS product, to plot all the locations we’ve visited in the field, plot field locations, and any other subsurface information that we have like well construction reports. So the final map has the geology of the bedrock underneath the soil for all the different parts of the county. In about two years from now, I hope to have a bulletin published by the Wisconsin Geological Survey, that will have a full explanation of the county’s geology, as well as a large county-scale map of the bedrock. This entry was posted in Go Green! and tagged Video on September 28, 2009 by Michael Heine. GREEN BAY —Academic advisers at the University of Wisconsin-Green Bay want north-central Wisconsin residents to know that a bachelor’s degree isn’t as far away as once thought. UW-Green Bay’s Adult Degree Program makes it possible to earn a bachelor’s degree through online and weekend courses in Green Bay, as well as with course instruction at Nicolet College in Rhinelander. The Adult Degree Program offers more online classes than any other major at UW-Green Bay. Also, courses that meet on Saturdays only meet 3-4 times the entire semester, either at UW-Green Bay or Nicolet College, said Eric Craver, Adult Degree Program academic adviser. “These are degree options for adult learners offered through online courses, Saturday classes and with resources available at other UW System colleges and Wisconsin technical colleges in the area,” Craver said. One of the degrees UW-Green Bay offers is the Bachelor of Applied Studies degree, which is designed for technical college graduates. It allows for the transfer of a minimum 60 earned credits toward a UW-Green Bay Bachelor’s of Applied Studies degree, Craver said. Also, students completing an associate degree at UW-Marathon County or another UW College campus will transfer all earned credits to UW-Green Bay toward the Bachelor of Arts or Bachelor of Business Administration degrees. Craver will lead two informational sessions about the Adult Degree Program and UW-Green Bay degree options for adult learners in early October. He will be at the Nicolet College campus in Rhinelander at 6 p.m. Tuesday, Oct. 6, in room 202 of the University Transfer Center, 5364 College Drive in Rhinelander. On Wednesday, Oct. 7, Craver will lead an information session at 6 p.m. on the UW-Marathon County campus, 518 S. Seventh Street, Wausau, in the Terrace Room (room 100) of the Main Building. Following the information sessions, UW-Green Bay academic advisers will be available to meet with enrolled and potential Adult Degree program students on Nov. 17-18 at Nicolet College in Rhinelander, and on Nov. 19 at UW-Marathon County and Northcentral Technical College in Wausau. For more information about UW-Green Bay’s Adult Degree program contact Eric Craver at (800) 621-2313 or visit http://www.uwgb.edu/adultdegrees/ . This entry was posted in News, News Releases on September 24, 2009 by Michael Heine. GREEN BAY — Throughout the month of October, the University of Wisconsin-Green Bay is addressing the issues faced in gay and lesbian communities. Students and staff will pass out “Gay? Fine by Me” T-shirts to those wishing to show support of the lesbian, gay, bisexual, transgendered and questioning (LGBTQ) community. The T-shirt campaign runs the week of Oct. 5 in the University Union and Cofrin Library. On Wednesday, Oct. 7, a “Does Your Mother Know?” panel discussion will address the coming out experiences of UW-Green Bay LGBTQ students. The discussion, which is free and open to the public, will be held at 4 p.m. in the University Union’s Christie Theatre. The two events are precursors to UW-Green Bay’s second-annual Ally Conference, scheduled from noon to 6 p.m. Saturday, Oct. 24. The conference emphasizes diversity and accessibility issues within all student populations, and also provides a safe environment to celebrate the diversity and talents of women, people of color, persons with disabilities and the lesbian, gay, bisexual, transgendered, questioning (LGBTQ) community. Conference participants will also learn how to become an ally and advocate for these communities, organizers say. The conference, which also features best-selling author and LGBT civil rights leader Shane L. Windmeyer as the keynote speaker, is free for UW-Green Bay students and $25 for community members. Register by Wednesday, Sept. 30 and receive a conference T-shirt. Registration is available online at http://www.uwgb.edu/aic/ally. For more information on these events contact Multicultural Adviser Mai J. Lo Lee at (920) 465-2720, or via e-mail at lom@uwgb.edu. The ALLY Conference is sponsored by UW-Green Bay’s American Intercultural Center, Campus Life Diversity Taskforce, Human Development Program, Social Change and Development Program, Women’s and Gender Studies Program, Social Work Program, Office of Student Life, Office of Residence Life, and the Residence Hall and Apartment Association. Harmony Café in Green Bay is a community sponsor. 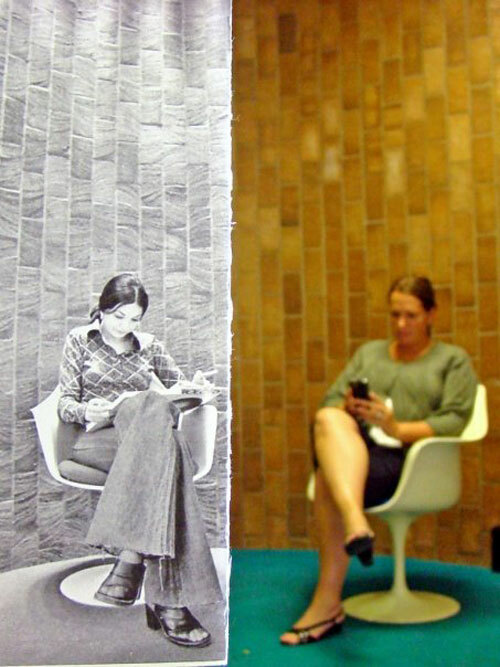 This entry was posted in News, News Releases and tagged community, connecting, diversity, lectures, Student Life, students on September 23, 2009 by Michael Heine.